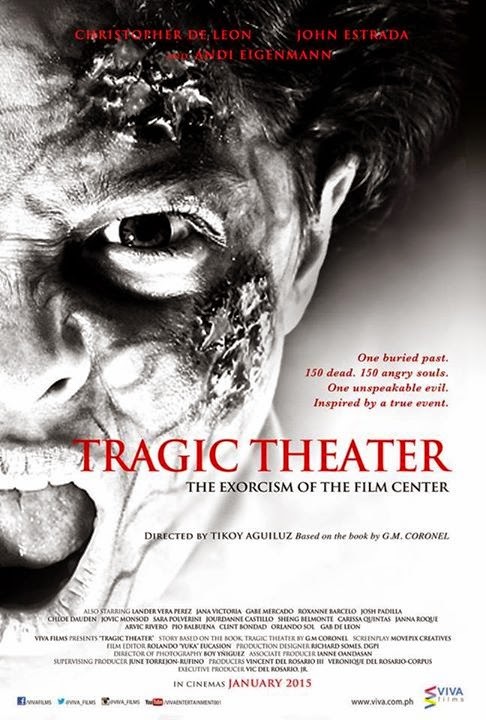 Home / FILIPINO FILMS / FILM POSTERS / MOVIE TRAILERS AND INFO / Watch the Uncut Trailer of Viva Films' "Tragic Theater"
Watch the Uncut Trailer of Viva Films' "Tragic Theater"
In February 1999, a group of spirit communicators attempted to exorcise a film center in Manila of ghosts. These supernatural beings were believed to be those of the victims from a fatal accident during its hasty construction. First look at the official poster of TRAGIC THEATER featuring Christopher De Leon, John Estrada and Andi Eigenmann. Based on a novel written by G.M. Coronel and directed by Tikoy Aguiluz, #TragicTheater will hit theaters on January 8, 2015! Unknown to them, something had long ago taken sanctuary inside the building, feeding on the anger and misery of the victims’ souls. They learned this secret too late and walked into a horrifying encounter. Starring Andi Eigenmann / Christopher De Leon / John Estrada. Brought to you by Viva Films. Coming this 2015.